If you have not already done so, sign up for a free account via our homepage and you'll be able to access your own 'subscribe to newsletters' script that you can simply add to your website allowing you to collect and manage your customers information online. Adding a free subscribe form to your web site is a great way to attract new subscribers and it couldn't be easier. Simply click on the the list you would like to create a subscribe form for in the Manage Subscribers section. 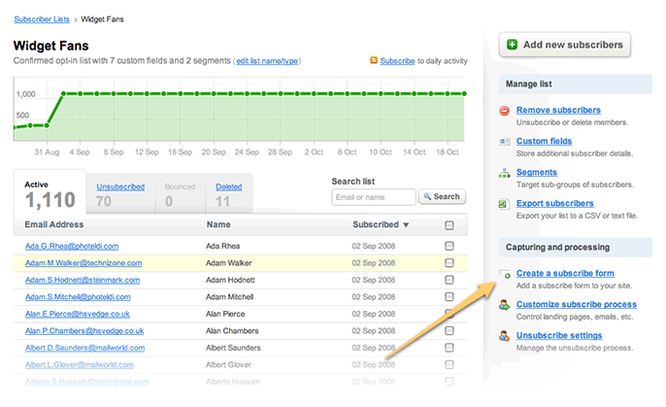 Then, click the Create a subscribe form link in the right hand column, under "Capturing and processing". 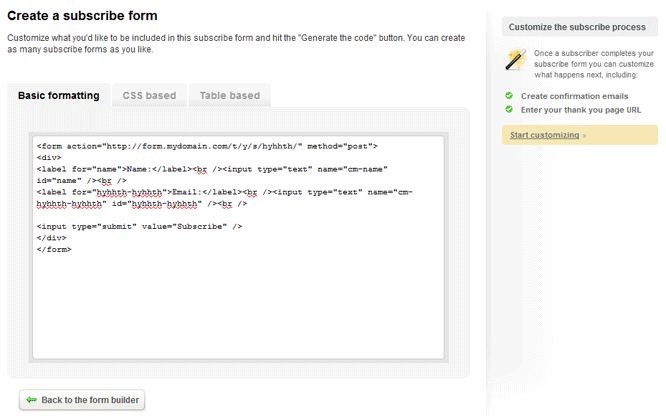 Next, choose which fields you'd like to include on your web form and click the "Generate the code" button. Finally, copy the supplied HTML code and paste it into the HTML code of the web page you are adding the form to. We've provided a few options for you depending on the formatting you prefer, including basic, CSS and table formatting. You can format the form in any way you like, just remember you can't change the action of the form or the name of the form elements. We also feature a number of simple subscribe form options you can use to extend the functionality of your subscribe form. Fields to include in the subscribe form - If you've added custom fields for your subscriber list (such as address, phone number, etc), you can capture them via the subscribe form. 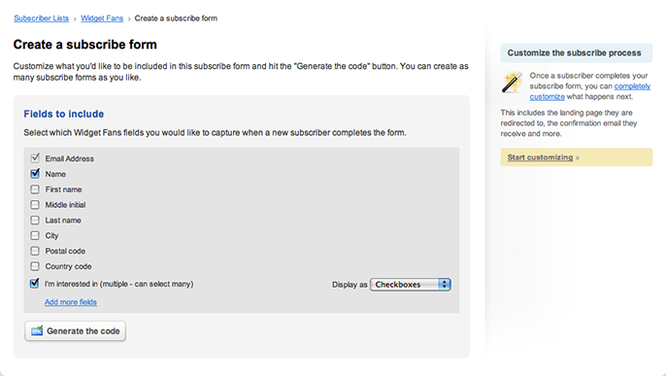 Just select the fields you want to capture under the 'Fields to include in the subscribe form' option. Add an opt-in checkbox for other lists - If you have any other Subscriber lists set up for this client, you can add checkboxes to the form allowing your subscribers to join other lists simultaneously. Subscribe Confirmation Page - You can specify your own web page that you would like someone to be redirect to once they complete this subscribe form. If you don't specify a page, a generic thank you page will be displayed to the subscriber. Subscription Confirmation Email - You can send all new subscribers a welcome message when their subscription is confirmed. You must tick the checkbox so you can customize the message and for the confirmation email to be active. The Initial Confirmation Page - This page should inform the subscriber that a confirmation email has been sent to them with a link they will need to click on to confirm their subscription to this list. The Verification Email Content - You can customize the copy used in the verification email, the subject and the from name and email address. The Secondary Confirmation Page - The web page would you like to be displayed after the subscriber clicks the confirmation link in the verification email.